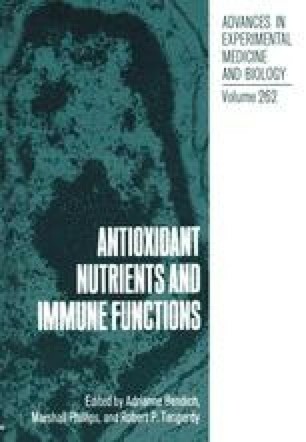 The effects of a single nutrient deficiency on immune function is now most extensively characterized using the dietary zinc deficient murine model. Deficiencies in zinc have rapid adverse effects on host defenses of humans and rodents. This impaired defense seems to be, in part, the result of a reduction in number of lymphocytes available for surveillance since residual lymphocytes are able to carry out many normal functions. In vitro, the lymphocytes were able to proliferate at a normal rate as well as produce antibodies or interleukin 2 in response to mitogens or antigens even when cultured in autologous serum to reduce the possibility of restoration of zinc deficient functions. Conversely, mononuclear phagocytes (MNP) from deficient mice had a significantly reduced capacity to associate with and kill the parasite Trypanosoma cruzi (T. cruzi) which causes Chaga’s disease. Moreover, indicating the specificity of the deficient function, a short incubation of ZnCl2 but not other metals completely restored the capacity of MNP from deficient mice to take up and kill T. cruzi. Dependency on H202 production by the MNP’s oxygen burst for killing of T. cruzi.suggested that MNP from zinc deficient mice might produce smaller amounts of H202. The possibility that zinc might play an integral role in the oxygen burst seemed evident from the ability of zinc to quickly restore the killing capacity of MNP from the zinc deficient mice. Further, the renewed interest in the role of metals in the production of highly reactive oxidants in biological systems prompted a literature search to identify enzymes and/or reactions known to be involved in the generation of oxygen radicals or toxic oxygen metabolites that might be zinc dependent. The literature review provided herein indicates many possible roles for zinc in the generation of toxic oxygen species. The data indicated that normal levels of H202 are produced by MNP from zinc deficient mice. The amount of H202/mg macrophage protein is normal in response to phorbol or opsonized zymosan but reduced in response to direct stimulation by T. cruzi. However, the reduced H202 production by T. cruzistimulated zinc deficient MNP was due to reduced stimulation as a result of fewer T. cruzi associated with the MNP. Thus, H202 levels/parasite were the same as zinc adequate controls. Yet, this does not preclude the possibility that reduced killing of T. cruzi by MNP from zinc deficient mice may be due to a function for zinc in the actual killing process or in the production of some other agent important in the killing of T. cruzi.